I was fortunate enough to attend this years SXSW with a few of my colleges from Re| Sydney. On our return we hosted a retrospective at the Museum of Applied Arts and Sciences sharing our key take-outs the conference with over 60 marketers in a the talk we titled - Wonder + Delight. Below is my half of the retrospective — Delight. The interactive and convergence tracks at this year’s SXSW were full of the latest innovations, acronyms and platforms. You’d expect no less. It was truly a preview of years to come, from teleporting sushi and AI rap battles to the Google house and gesture workshops. You couldn’t help but revel in the delightful possibilities of the future. It’s no surprise that AI featured heavily on the SXSW roster this year. Whether we realise it or not, artificial intelligence is already a large part of our daily lives – from those smooth(ish) chats with Google Home to adaptive cruise control, or even the rise of the self-driving car. Like all things new and unknown, it’s easy to be fearful. While I’m personally a fan of asking Siri to rap to me, AI advancements have at times caused me to question whether robots might one day take my job. But what if rather than fearing artificial intelligence, we could embrace it to ultimately enhance our creativity? Jenna Niven might just have the winning formula. At her SXSW session, she shared how pairing creative people with AI can lead to limitless creativity. Her proof? StitchFix. A personal styling service that partners stylists – real human ones – with a sophisticated AI agent. This simple formula allowed StitchFix to make over a million bespoke consultations with only 1000 personal stylists, simply by using AI-generated insights to make the final selection of items. StitchFix is just one example of how businesses can harness AI to unlock creativity at a level previously thought impossible. Which means, as brand creators and guardians, we should be putting AI at the heart of our creative processes. We can all remember the days when digital and motion were considered add-ons or separate streams of work. Similarly, the biggest gains from AI can be made by embedding them in our creative process right from the start. There was a lot of talk about voice technology at SXSW this year. We’re entering a new digital age where machines are participating in domains that, up until now, have been exclusively human. And while everyone has been focused on developing the technology, it’s time to turn our attention away from the physical tech and focus on the brand implications. You only have to look at the stats to realise how important voice will become for brands. According to research undertaken by PWC, 46% of Americans use digital voice assistants. 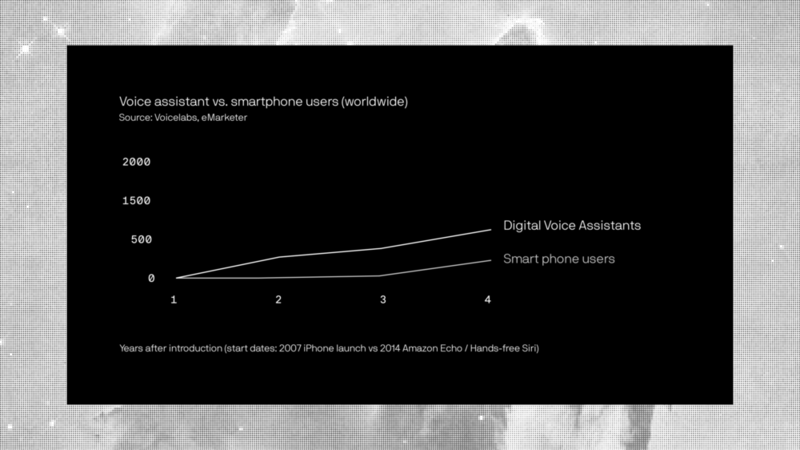 Adoption rates for voice assistants have already far surpassed that of smartphones. It's an entirely new frontier, and with that comes new opportunity to connect with customers. But for brands to be experienced through voice, naturally they need to feel more human than they have in the past. If brands will be living in spaces completely devoid of visuals, we need to build far more depth into our brand personalities to allow them to meaningfully connect when they exist as nothing but a voice. This is no simple task. It’s no longer about how a brand looks, but rather how a brand looks at the world. How does it think? How does it respond to people and emotions? How does it feel about events that are unfolding in our world? Whilst visual design can be something that is subjectively liked, brands more than ever need to become shorthand for trust. SXSW was full of the latest and greatest advancements in technology, and while the next frontier is certainly an exciting one, it raises a lot of questions. Questions that we as brand creatives and marketers should be actively seeking the answers to. With that in mind, here are five questions that stayed with me long after I’d left the bright lights of Austin behind. Does every brand have the right to speak? Will every brand have its own voice and speak directly to users? Lucas Watson from Intuit was of the belief that less is more. He believes that the likes of Alexa, Google and Siri will become our trusted assistants; the gatekeepers of voice-led experiences. But what does this mean for other brands? How do we integrate them? What responsibility falls to the gatekeepers as we share more and more data with them? Are we instilling bias in the bots, assistants and voices we create? Under 18s are predicted to be one of the biggest users of voice-led AI. And the vast majority of voice assistants are female. Are we teaching the next generation that it’s OK to bark orders at a woman? Are we reinforcing old stereotypes of women in service roles? Are our coders subconsciously injecting their own personality, agenda or point of view into the products they create? Should we design for moments of failure? We often design for the best moments of experience – the moments where everything works seamlessly. But should we design for failure? Those moments when technology falters or the experience isn't quite right. Can we win people over and build stronger brand advocates in these moments of imperfection? How much of a brand should be adaptable? Technology is allowing us to build brands with bespoke, user-specific utility. But how much should we allow for brands to flex? What parts of a brands or product need to be fixed, flexible, or free in order to make for great experiences and strong attribution? How does the role of a designer change in an automated world? As AI facilitates automation more than ever, our role as designers will inevitably change. As Tim Allen from Microsoft said, “designers shouldn’t forget our ability to inspire.” But is it only humans who are able to bring that level of humanity into creative work? Or is it possible to automate wonder and delight?